The Wyoming Department of Environmental Quality has identified the source of a costly gasoline seep that leached an unknown quantity of fuel into the Middle Fork of the Popo Agie River in Lander. A “Red Tag Order” accompanied the NOV, barring Maverick from selling or receiving fuel at its Lander location until the problem is resolved. The Lander Fire Department, responding to reports of a strong gasoline odor, discovered an oily sheen on the river near its Main Street underpass immediately downstream of a Maverick gas station April 2. The EPA arrived onscene April 4 to begin trying to stanch the flow of contaminants into the navigable waterway — an ongoing endeavor that’s been hampered by fire and inclement weather. 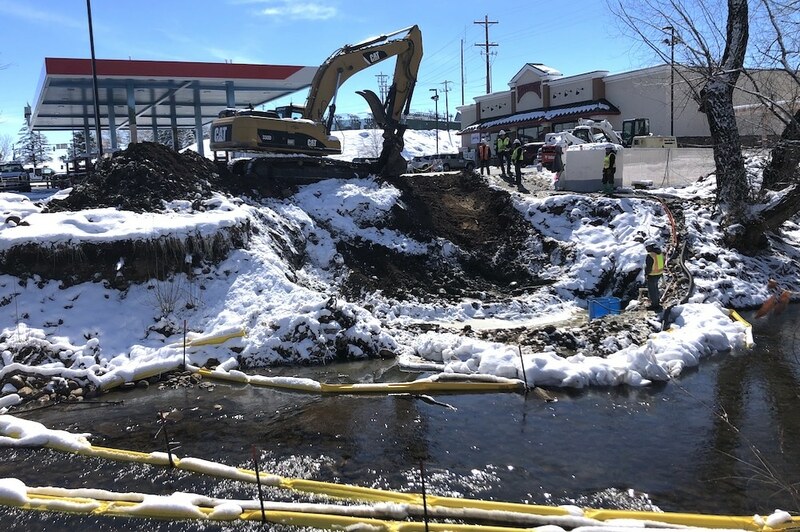 Responders from the federal agency are racing to complete a concrete barrier wall, and backfill the excavated bank, before spring runoff arrives. The Notice of Violation notes that because it resulted from an overfill, the spill “is not eligible for cleanup under the Corrective Action Account,” and that DEQ can “seek cost recovery.” The DEQ does not yet have an estimate of how much the response has cost state and federal taxpayers, according to agency spokesman Keith Guille. The NOV is not a “ticket”, Guille said, but rather an allegation — the agency’s official notice to the public, and to the accused violator, of what it believes caused the problem. It is the first step in what typically proceeds as a negotiation, he said. Maverick can respond with an explanation and evidence of its own. Required corrective actions, cost recovery, fines and all other elements leading to a Notice of Compliance resolution are all likewise subject to negotiation. Such discussions can land in court, Guille said, but rarely do. WyoFile did not receive a response to requests for comment from Maverick by press time. There is more to this story as all these tanks are required to have overfill protections including alarms and shut off valves to prevent this type of spill. Someone knew something at the time of the spill. So either the fuel delivery operator and/or the station had to know immediately that there was a release and no one reported it, hoping it would go away. The lack of candor increased the environmental degradation and should end up costing the operator and/or the fuel delivery company to pay the bill, but there should be some punitive fines and firings for the coverup.